It's time to celebrate the arts! The Stevens Point area is once again inviting visitors to celebrate the arts in Portage County this spring. This year’s Celebrate the Arts campaign aims to draw visitors to the area through exclusive lodging and ticket packages, a unique variety of arts events, sweepstakes and more. Last year’s Celebrate the Arts campaign was a big success for the area, contributing more than $400,000 to the local economy. Attendance for arts events also saw a 5% increase on average, and hotel room rates increased by 5% during the campaign period. The SPACVB has expanded its lodging and ticket package offerings from last year, and this year’s special deals include vouchers for events and performances at UW-Stevens Point, Central Wisconsin Area Community Theater, the Tomorrow River Concert Series and more. The limited-availability packages start at $85. More information on packages and deals can be found here. Every spring sees a bevy of events in the Stevens Point area, and this spring is no different. From annual events like the UW-Stevens Point Festival of the Arts (April 6) and the Portage County Cultural Festival (May 10) to special events like author Sherman Alexie’s appearance at the UW-Stevens Point’s Performing Arts Series (May 1), visitors to the Stevens Point area will find plenty of events to meet their interests. And that’s not even including the number of ongoing galleries and exhibitions at places like Gallery Q, the Scarabocchio Art Museum or UW-Steven Point’s Carlsten Gallery. More arts events can be found here. April 1 will see the launch of the Celebrate the Arts Spring Sweepstakes, which will award one lucky winner with a $500 arts getaway to the Stevens Point area. The grand-prize package will include a $250 prepaid credit card, a two-night stay at a local lodging property, two tickets to a 2014-15 UW-Stevens Point Performing Arts Series event, and more. 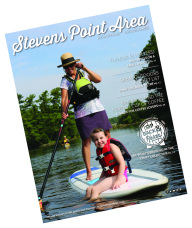 For more information about the Stevens Point area, visit www.stevenspointarea.com. You can also find us on Facebook, Twitter and Pinterest.